75kv and 90kv X-ray machine high voltage cables with connectors connect the high-voltage power supply to the x bulb or any other HV device over a distance of several meters.They transmit small currents at milliamps at a dc voltage of 30-200 kv, sometimes even higher. These cables are flexible, with rubber or other elastomeric insulation, stranded conductors, and outer sheaths for braided copper wires.The building has the same elements as other HV power cables. Its function is to send the high-voltage output of the high-voltage generator to the poles of the X-ray tube and send the heating voltage of the filament to the filament of the X-ray tube. Cables include conductors and insulation materials.Different types of 75kv and 90kv X-ray machine high voltage with connector have different applications in instruments, ignition systems, communication and dc power transmission.In all applications, the insulation of a high-voltage cable cannot be deteriorating due to high pressure stress, ozone or tracking due to emissions in the air. Cable systems must prevent high-voltage conductors from contacting other objects or people and must control and control leakage currents.Cable connections and terminals must be designed to control high pressure stress to prevent insulation damage. 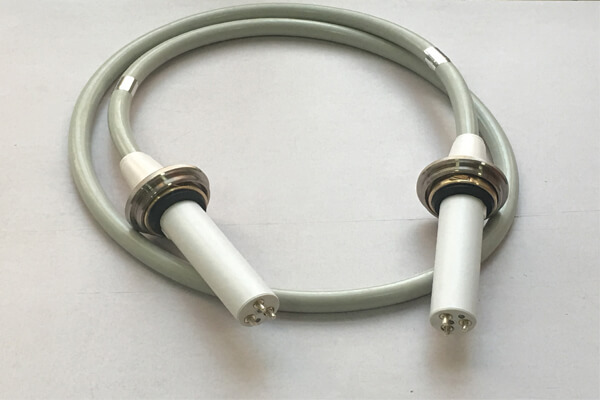 The Newheek 75kv and 90kv X-ray machine high voltage cables with connectors are classified into two types of cores: concentric and non-concentric, to produce X-ray high-voltage cables.The 75 kv high-voltage cable is suitable for 125 kv X-ray machines and 90 kv high-voltage cable is suitable for 150 kv X-ray machines.